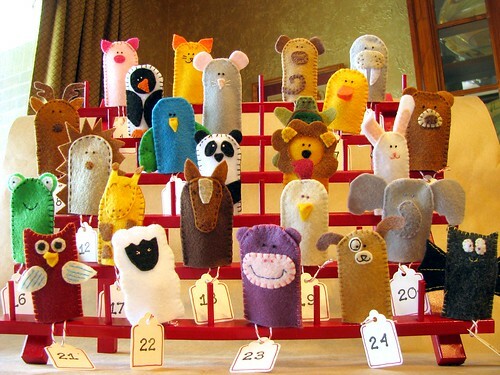 Finger Puppet Advent Calendar, DONE. I purchased the blank tags, then used stamps to add the numbers to count down the days until Christmas. The tags looked pretty bland, so I grabbed a fine tip Sharpie and traced a little red border along the edges, then tied on a short piece of red and white twine to loop over the little spool posts. My next challenge – finding a box for this and getting to the post office before it closes. Wish me luck! Sarah found a proper box and they all arrived safely! The pictures do NOT do this justice!! Thank you Sarah. It’s absolutely beautiful, and means a lot to me. 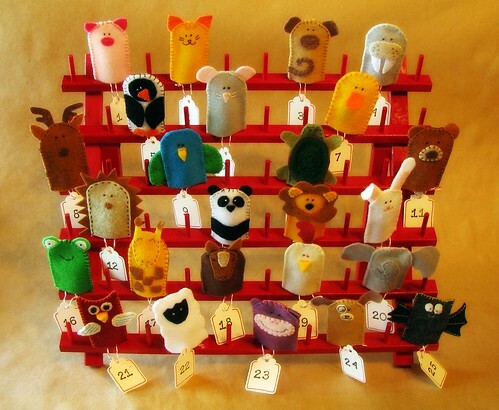 The absolutely best advent calendar I have ever seen!! Love your work – sooooo cute! CRAZY CUTE!!! What a darling advent. So nice to find my blog in your blogroll, thanks so much! Thank you, Carla and Cathe! Cathe, I’ve been a fan of yours for a while. I don’t even play poker but have an urge to make your poker chips, and your designs always seem to fit just right to me! Hi Sarah, Just thought I’d let you know that this is still my favorite advent calendar ever (I have all types, shapes and sizes) Some don’t even make it out for the holiday anymore because it’s just overkill – can you imagine? But THIS one always comes back out. And it’s the very last go go back in the box till next year. It still looks brand new, no wear at all. Beautifully crafted, well made and made with love!. FYI:: the grey mouse has been in my drawer since last year because thanks to Miss Maggie May he’d been kidnapped off the rack and remained hidden in her basket till February, so he never made it into the box. He’ll be joint his buddies before long ….. Thanks again. You always manage to give me reason to smile. That’s so funny Sarah … I never even put it together — cat = mouse! DUH! (is duh even used anymore?) I’m sooooo old! Love your crafts. Haven’t forgotten about the Clouds. Still working on that and so much more! !